Love this idea and it’s quick to make. Kids and adults will love it too! Cut off the top (greenery) of each strawberry so that the berry will stand on its own. 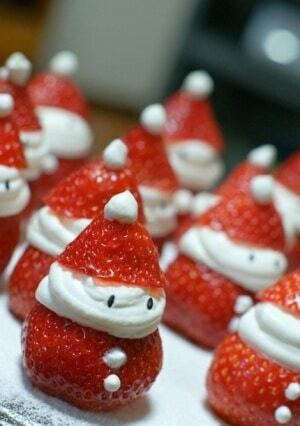 Slice off the pointed end of the berry to make the Santa hat. Squirt whipped cream in between the body of the berry and the hat to make the Santa face. Embellish with whipped cream buttons on the Santa body and the top of the hat. Add seeds for eyes. You’re done!